Ongoing sanctions against Russia by the US and the eurozone are harming both sides and go against international law, Russian President Vladimir Putin told TASS in an interview on Friday. These sanctions are “contrary to the principles of the WTO, the General Agreement on Tariffs and Trade, the so-called GATT. 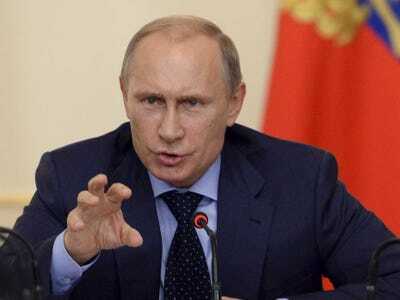 The United States created this organisation once upon a time, but now they themselves are grossly violating these principles,” Putin said in the interview. The sanctions that several G20 countries have taken against Russia “run counter to the very principles of G20 activities, and not only the activities of the G20 and its principles, they are counter to international law — because these sanctions can only be introduced by the United Nations and its Security Council,” he added. Earlier this year, the US and the EU imposed a series of sanctions on finance, energy and defence sectors in Russia. The sanctions were instituted in an effort to further isolate Russia politically and economically, and in particular, to hurt the “areas of importance to President Putin and those close to him,” according to President Obama. “[The sanctions are] harmful, and of course, they cause damage to us, but they’re also harmful to them — because they undermine the entire system of economic relations. I really hope, I assume, that this will ultimately be understood and will remain in the past,” Putin added. The Russian economy has taken a serious beating following the sanctions. For starters, the ruble is now in free fall and inflation is way above target. Meanwhile, falling oil prices have put immense pressure economy. Putin said on Friday that the Russian economy is prepared for a “catastrophic decline in energy prices.” Because the Russian economy is so dependent on oil, a sustained decline in oil prices could impede Russia’s ability to meet financial obligations. Consequently, in an effort to shift away from reliance on Europe and the United States, Russia is currently exploring partnerships with China. Although Putin spoke at length about the sanctions during the interview, he insists that he will not bring up any of this during the G20 Summit, which is currently going on in Australia. “If [the discussion over the sanctions] comes up, then of course I will say this, but I myself have no intention of bringing up these questions in discussion — I think that it is useless. Everyone understands anyway,” he said.